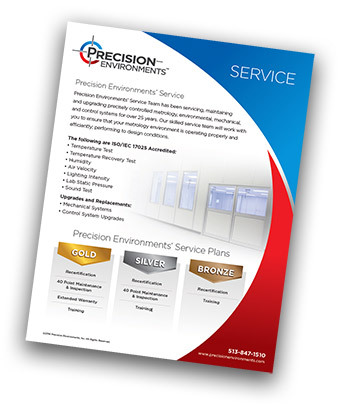 Lab Service Plans | Precision Environments Inc. Precision Environments lab service team has been servicing, maintaining and upgrading precisely controlled metrology, environmental, mechanical, and control systems for over 25 years. Our skilled laboratory service team will work with you to ensure that your metrology environment is operating properly and efficiently; performing to design conditions. Learn more about our laboratory service plans by downloading the laboratory services brochure on the right. Since 1989, our highly skilled team of in-house proven professionals provide years of experience to ensure a successful laboratory environment. Our team has the right mix of skills and experience to deliver world-class service having designed and constructed industry leading laboratory environments, achieving the most rigorous protocols. All of our services are backed by a satisfaction guarantee and we ensure that your laboratory environment will meet or exceed your production requirements. Contact us to learn more about our laboratory services and to learn how our team of professionals can help you and your company.